Unboxing the package, we discovered the small beast covered inside a puffed wrap, whose purpose is to protect the SMPS from bumps and bruises. In addition to that, we found an instruction guide that would definitely come in handy for the users. There is also a power supply cable in-store unlike the VP350PS, we reviewed, that didn’t have one in its package. The black color of the body will definitely hook you into its basic and simple layout. The design may not be that flashy but the black color definitely adds an aura to it. The next common thing that we noticed is the honeycomb layout which is a necessity to channelize proper air-flow both inside and outside the SMPS. 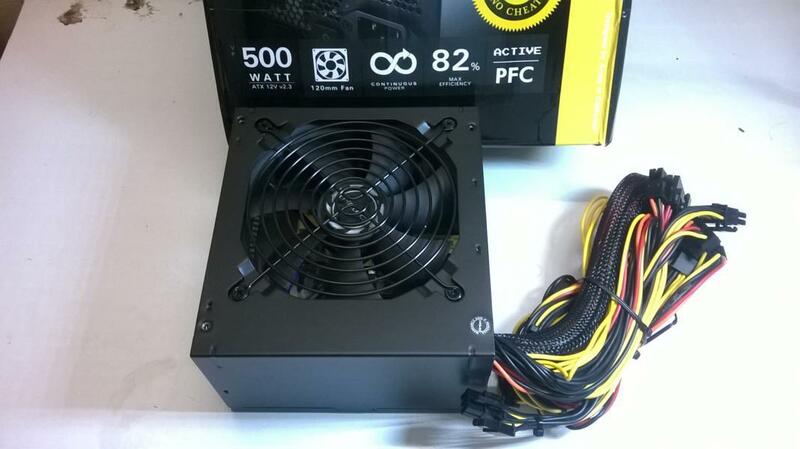 Unlike, the BP350PS, this PSU has an octagonal layout for the circular shield protecting the fan. This layout can prove to be highly effective for allowing proper heat escape from the PSU. Voila! There is also a power switch just beside the honeycomb surface, which you can use to turn the device on/off. Then it was time for us to unscrew the PSU to reveal the silent devil present inside it. The Antec VP500PC uses standard forward switching topology with individual voltage regulators for the multiple rails. 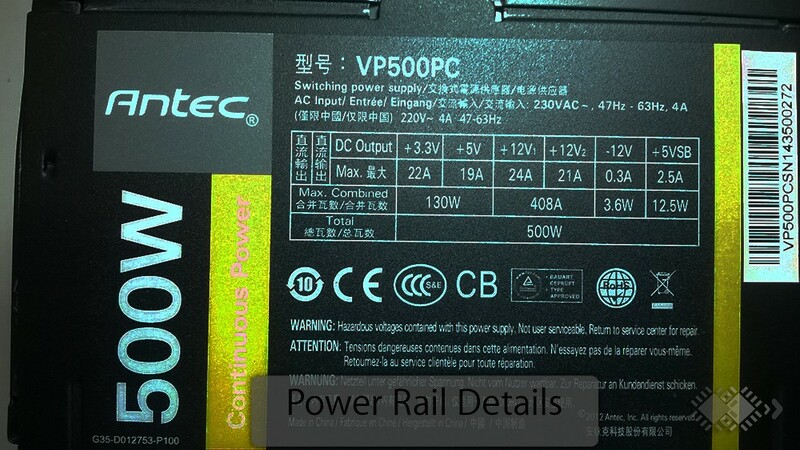 Antec VP500PC uses a separate output transformer/secondary transformers for each rail and this results in lower efficiency as well as increased output noise. The DC-DC rail designs are more expensive but have a lot more efficiency and stable power for your critical PC hardware with almost no noise. In other words, the company uses transformed AC to DC rail which has less efficiency and more noise. But a DC-DC rail is more efficient and stable with an almost negligible amount of noise. AC-DC transformed rail is a cheaper setup than the DC-DC rail. 1. 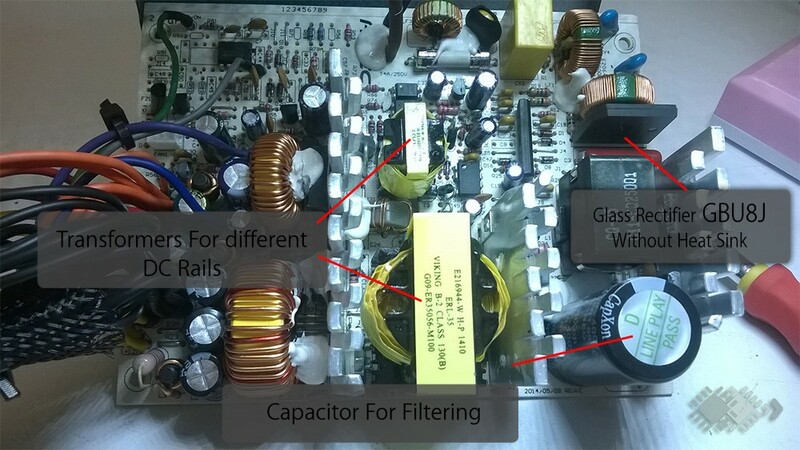 Filtering: 4-Y Capacitors and 2-X Capacitors are used to protect the components from electric surge and give a steady noise-free output. On the other hand, these capacitors look a little smaller and are of average quality. But overall, in this price range, it is satisfactory. 2. Rectifiers: VP500PC uses a standard glass rectifier which is a simple silicon rectifier having a disadvantage of a voltage drop of 1 volts at full load. 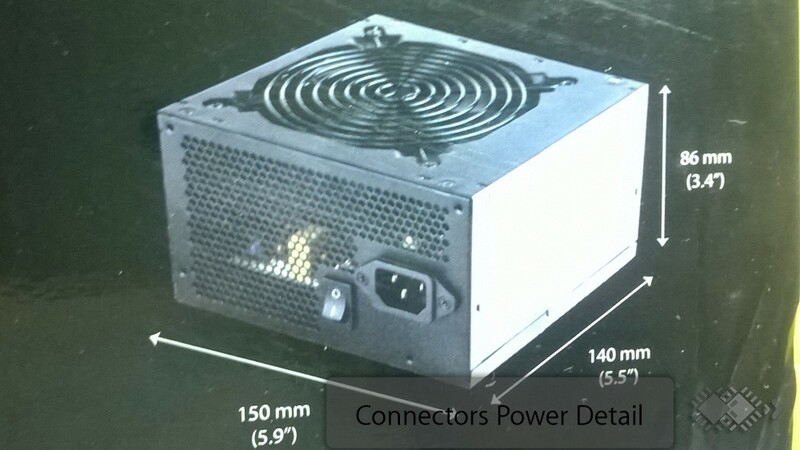 The peak forward current of this rectifier is 8 amps when used with a heat sink but inside the PSU, there is no heat sink connected to the GBU8J (See the data-sheet). So while operating on full load, there will be a bit of heat and that’s a drawback. Technically, GBJ25L06 (See the data-sheet) which is also a glass bridge rectifier having 25 A peak forward current has been more suitable here. 3. Storing and Filtering the Rectified Current: For storing the current after rectification capacitors are used. 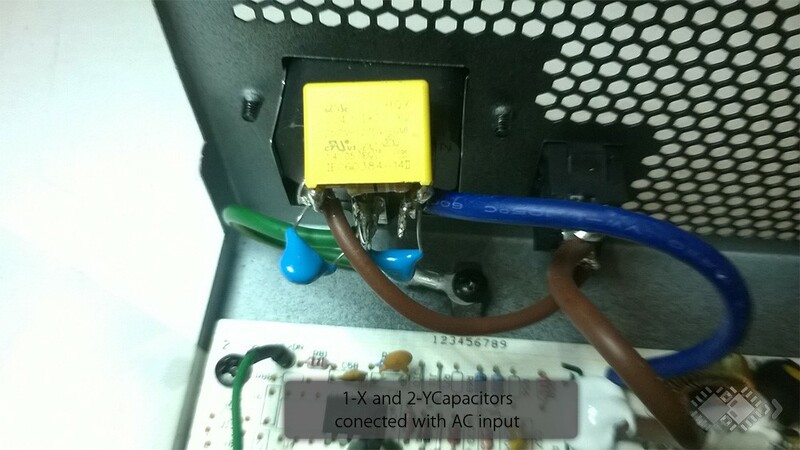 Here inside the Antec VP500 PSU, 270μF capacitors manufactured by Capxon are used, which are of average quality. Japanese or Korean Capacitors are more suitable for stable operation. But in this price range, It’s not that bad. 4. Smoothing: Even after filtration and storing the current using capacitors there is always some ripple (noise in the DC). This rippled DC output then further undergoes smoothing by several small and big capacitors to give a pure DC output. These capacitors are of mix quality and most of them are CHINA build. That is a little bit disappointing. 5. 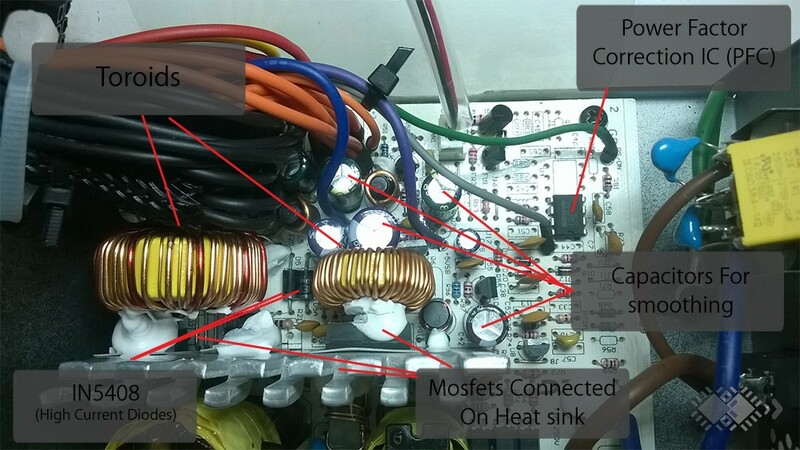 Rest of the components: For Power Factor Controller (PFC) CMPFD86 and the MOSFET SVD13N50 on heat sink are used which is a standard configuration for 13A output gain. 6. Output Cables: The output cables seem to be a little bit thin but that is enough for a 500 Watt PSU. Overall, the hardware this PSU offers is a mixed variety of components assembled together. Some of the components as mentioned above could have been better. But one should also keep this in mind that it is a budget PSU. To be frank, the hardware could have been better in the same manufacturing cost. You have the most important 24 (20+4) pin-connector and a single 8 (4+4) pin connector readily available. Nowadays, most of the mobo’s prefer 8 pin connectors over 4 pin one’s that were used in traditional mobo’s. 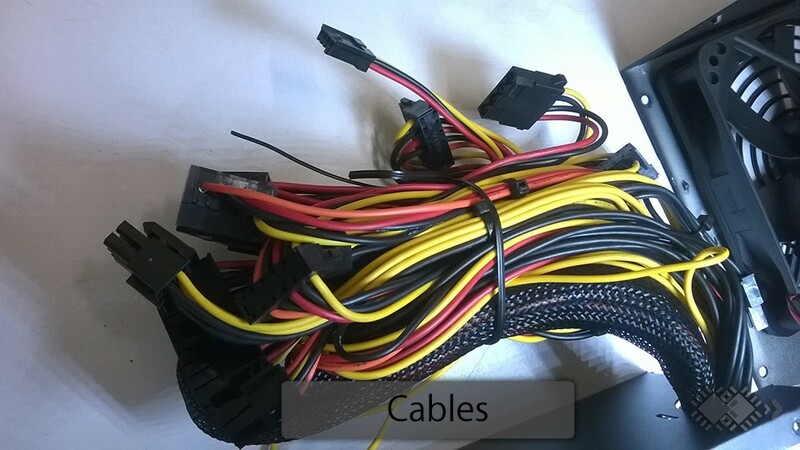 Furthermore, you get 3 Molex cables, 4 SATA connectors, 1 Floppy, a single PCI-E 6 pin and 2 PCI-E 8 (6+2) pin connectors as well. The PCI-E 6 and 8 pin connectors are generally used to juice up your graphics card. The floppy connector really seems irrelevant. Perhaps, this could come in handy to some antique rig owners. Summing up, Antec has done a hell of a job to make the cable connectivity highly flexible. In other words, there is a good showcase of variety in connectivity. The only limitation that we encountered was the inadequate length of main power cables (24 and 8 pin connectors). They should have been a tad longer. The VP500PC houses a 120mm double ball bearing noise-cancellation fan that serves the most basic and vital purpose of cooling. Generally, double ball bearing fans are very effective in removing internal heat from the PSU. 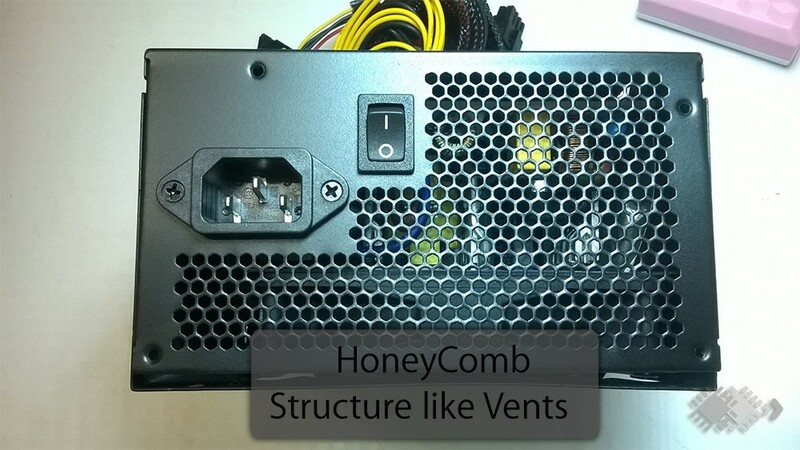 In addition to that, the honeycomb structure and the octagonal layout, that we mentioned before, play a significant role in facilitating proper airflow in and out of the PSU, so that the temperature inside is as low as possible. Honeycomb is the best cooling layout at present. Overall, we would say, the architecture of Antec VP500PC has been properly optimized to channelize effective cooling. VP500PC promises 82% efficiency with 500W continuous power supply that puts it in the list of bronze certified products. To be frank, Antec is one of the few companies that include dual 12V rails in their budget range of PSU’s which you won’t find in the products of top-notch companies like Corsair and Cooler Master. But that doesn’t mean dual rails hold a better advantage as compared to single rails. It is actually a cost-effective and cunning marketing strategy implemented by most of the companies to lure the customers. The dual 12V rails provide a total of 45 amps and 400 wattages of power, that is mainly used to juice-up heavy duty components like GPU’s and processors. The VP500PC can easily handle any mid-range GPU like GTX 750 Ti or GTX 660. The SMPS also offers high-security grade features like Circuit Shield to prevent current surge as well as voltage fluctuations. 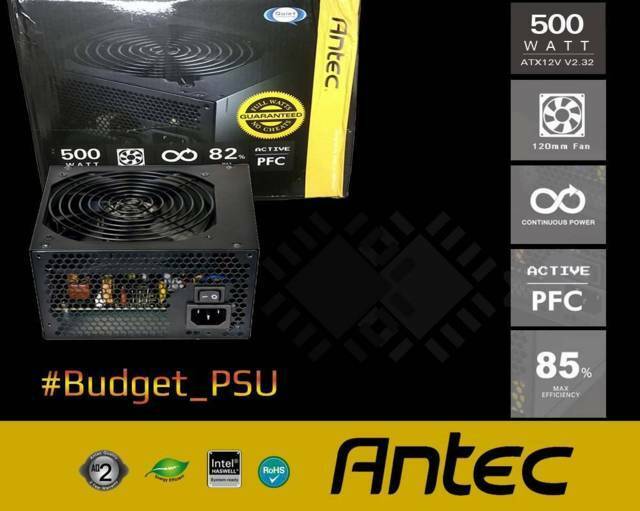 The Antec VP500PC is almost an ideal budget PSU for mid-range gaming and regular PC’s as well. Although, there are some tough competitors like Corsair CX 500 and Cooler Master B500 available at the same price range, the VP500PC steals the show with its state-of-the-art power distribution system, security technologies, and performance. Probably, you won’t find anything better at this price range. 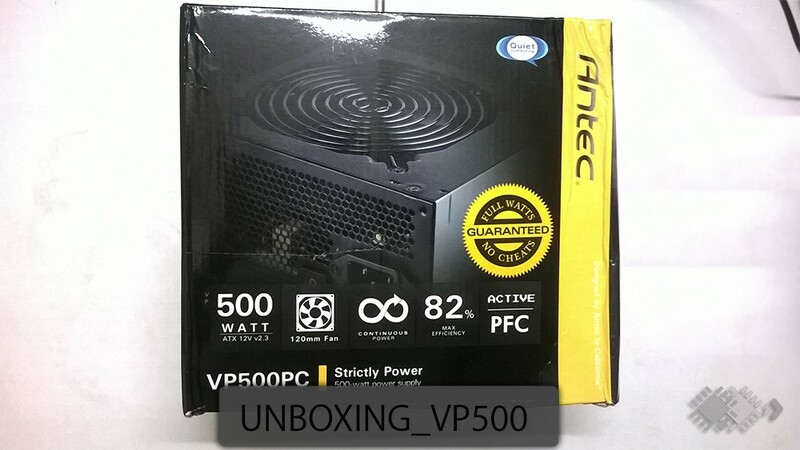 With 2 years of warranty and a price tag of around INR 3.3K, Antec VP500PC is one among the best budget PSU both for gaming and normal utilities. If you are looking for a good mid-range gaming SMPS available at an affordable price range, the VP500PC is definitely an eye-candy deal for you. My Antec VP500PC blew up! no smokes and smell, just a little pop sound and sparks. I have voltage stabilizer at home then how could this happen? My PC at full load consumes 140 watts! What about your cable management? That could be a factor. What cabinet do you use? What was your system spec.